Medical sheepskins and wool mattress pads. wool, then you will want to read on. preventing and treating bed sores. More on the studies later. Wool Products" file full of Testimonials. A few of them are listed later. improvement in the residents comfort. Everyone involved were pleased with the results. Prevent Bed Sores by distributing weight & reducing friction. Natural wool fibers of medical sheepskin move with the body. The best nights sleep you have ever had. Comfortable long periods in a wheel chair. Air flows through wool fibers of medical sheepskin to provide an air cushion. Stops the pain of back ache, arthritis and rheumatism. Medical Sheepskin and Wool Covers are Warm in the winter, cool in the summer. those with cold feet due to poor circulation. Machine wash and dry Your Medical Sheepskin and Wool Products. cleaners. We include washing and drying instructions. Our Medical Sheepskins have soft suede back. Sheepskin will not slide on bed sheet, wheel chair seat or lounge chair. Medical Sheepskin and Wool Products Have Natural lanolin. Lanolin provides a luxurious soft feel against your skin. 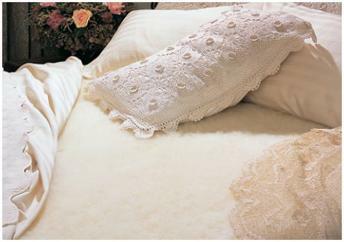 Medical Sheepskin and Wool Products are Durable, long lasting. continue to look great and last for years (decades really). can withstand multiple washes at 175F (80C) to achieve high level thermal disinfection." Many thanks for introducing me to your extra large full length medical sheepskin bed pad. sleep ever! I had tried medical sheepskin pads from other stores but they were to small. has done on your wool bed pads. second set while I am washing the first. I am confined to my home, and to the wheelchair. medical sheepskin pads are a MUST for me. large medical sheepskin bed pads, and the last two month were a lot more comfortable. Thanks to you and my Mother! double pads are up to 35% larger! DAY FREE TRIAL. Just don't wash them or alter them in any way. our medical sheepskin and wool products! products are made from full, large, #1 premium sheepskins. medical sheepskins to be fully washable and not to slide! know how to wash and dry them! We include care instructions with every order. (not overlapped) you will not feel the seam. We sew ours with the edges touching. You get your money's worth! pads, and slippers - GUARANTEED. The lowest price for the quality - GUARANTEED. on wool fitted mattress covers and pillow shams. No questions asked. See our Policies page. meet the price. See our PRICE MATCH POLICY on our Policies page. purchase price back! So you have nothing to lose and everything to gain. Fitted Medical Wool Bed Pads & Pillow Shams! ALTER THEM IN ANY WAY. like our medical sheepskin products offer superb craftsmanship and a "hands-on"
quality that is not found in the competition. Buy More Than One Medical Sheepskin Item & Save an Additional Amount. the bed and on the recliner without having to move it from one to the other. NEXT DAY SHIPPING The sheepskin knee wrap is made from a high quality medical grade sheepskin pelt. It is designed to reduce pressure sores by transmitting pressure evenly and smoothly allowing for maximum circulation. Fleece length of 1�� and it is machine washable. NEXT DAY SHIPPING! The sheepskin crutch cover is designed to fit most crutches. They are easy to install and can be machine washable. NEXT DAY SHIPPING! One of the problems bed ridden patients have is bed sores on their heels. This heel wrap not only prevents heel sores, it provides the best in comfort! Made from natural sheepskin, the wool fibers provide a soft cushion that allows air to circulate to keep the heel dry. We guarantee it to work! One size fits all because of the Velcro fastener. CAUTION! - BEWARE OF LESS EXPENSIVE WRAPS THAT ALLOW THE VELCRO STRAPS TO TOUCH THE TOP OF THE FOOT. As with all of our medical accessories, the heel wrap is machine washable. NEXT DAY SHIPPING! One of the problems bed ridden patients have is bed sores on their elbows. Our elbow wrap not only prevents sores, it provides the best in comfort! 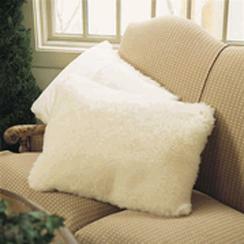 Made from natural sheepskin, the wool fibers provide a soft cushion that allows air to circulate to keep the elbow dry. We guarantee it to work! One size fits all because of the Velcro fastener. NEXT DAY SHIPPING! This single sheepskin bed pad is the same as the XL short pile single sheepskin bed pad MP102 except it has a 3.5 inch length wool fiber. Provides a little more padding. Prevent or cure bed sores. Has an ULTRA HIGH DENSITY 3.5 inch wool fiber length. NEXT DAY SHIPPING! Prevent or cure bed sores. A single sheepskin bed pad. This is the LARGE size medical pad, larger than most available today, as shown in the picture. This bed pad measures about 26" by 34". Has an ULTRA HIGH DENSITY 1.5 inch wool fiber length. NEXT DAY SHIPPING! Prevent or cure bed sores. This is the EXTRA LARGE size medical pad, larger than most available today, as shown in the pictures. Two of the EXTRA LARGE short pile sheepskins are sewn together to provide a full or double length bed pad. Measures about 30" by 82" with an ULTRA HIGH DENSITY 1.5 inch wool fiber length. FULL HEAD TO HEEL PROTECTION! NEXT DAY SHIPPING! Prevent or cure bed sores. A single sheepskin bed pad. This is the EXTRA LARGE size medical pad, larger than most available today, as shown in the picture. This bed pad measures about 30" by 42". Has an ULTRA HIGH DENSITY 1.5 inch wool fiber length. NEXT DAY SHIPPING! Prevent or cure bed sores. This is the LARGE size medical pad as shown in the picture. Two of the LARGE short pile sheepskins are sewn together to provide a full or double length bed pad. Measures about 26" by 68" with an ULTRA HIGH DENSITY 1.5 inch wool fiber length. FULL HEAD TO HEEL PROTECTION! Our 4 piece wheelchair seat and back pads, and armrests are made from our medical sheepskins, the highest quality sheepskin available. Prevent or cure bed sores. Provides pressure relief and moisture reduction, urine resistant, and machine washable in hot water. Secured to the wheelchair with attached straps. This item requires 7 business days production time. Our 2 piece wheelchair seat and back pads are made from our medical sheepskins, the highest quality sheepskin available. Prevent or cure bed sores. Provides pressure relief and moisture reduction, urine resistant, and machine washable in hot water. Secured to the wheelchair with attached straps. This item requires 7 business days production time. A pair of wheel chair armrest covers made from our medical sheepskins, the highest quality sheepskin available. Prevent or cure sores. Provides pressure relief and moisture reduction, and machine washable in hot water. Secured to the wheelchair with attached straps. This item requires 7 business days production time. OFF AT CHECK OUT. USE COUPON CODE "23-DISCOUNT"
NEXT DAY SHIPPING. These rubber sole slippers are the same as our soft sole slippers with the addition of a durable, non-skid, easy to clean rubber sole for greater protection and support.Wear them outside, to the mall, or anywhere street shoes are worn. LIKE THE SOFT SOLE SLIPPERS, THESE ARE GREAT FOR PEOPLE WITH POOR CIRCULATION! Includes a turn up collar. They, like all of our sheepskin products, are MACHINE WASHABLE. NEXT DAY SHIPPING. Our adult sheepskin slippers are guaranteed to keep your feet warm without causing that wet, cold clammy feeling you get with synthetic materials. The wool wicks away the moisture. GREAT FOR PEOPLE WITH POOR CIRCULATION! Includes a turn up collar. Soft sole slippers are ment to be worn indoors. However, going outdoors won't hurt them because they, like all of our sheepskin prodicts, are MACHINE WASHABLE. For outside use see our slippers with additional rubber soles.